What do you do after your heart has been broken? Amanda is a quiet, slightly nervous young woman who is trying to get on with her life after a failed relationship. She has always dreamed of going to Paris and seeing the Eiffel Tower and decides to join a coach tour of young travellers across Europe. The group seems friendly and there are plenty of fun times but who is that shadowy figure in the background? Could someone be stalking Amanda? I found Bon Voyage a very interesting fictional read. I enjoyed it from start to finish, the way each chapter represents a European city makes it very informative to the reader who has not been to Europe and gives a feeling of déjavu to those who have been to the mentioned places. I found the story very intriguing even though I am not a young reader! Travelling around the world does make you a great storyteller. I think Juliet M. Sampson, is definitely one of them. Bon Voyage is a personal travelogue of a girl named, Amanda who goes for a tour with the Go Hikey tour all over the Europe, starting from Brussels and wrapping up with the final stop, Paris. This book is not any love story, that will stop your breath for a moment, but it’s just a journey and those words of the author, will make you fall in love with the book, instantly. "A destination is not just a place, it's a new way of seeing things.."
Great and fast paced read which felt like I was reading someone's personal diary/travel blog. This is a story of how a woman recovers from a traumatic break-up and broken heart by going on a 21 day travel tour throughout Europe!! I like how the story doesn't just focus on the character's experiences or feelings - there is great insight into the history and sites she visits and I have to say, I learnt a fair bit while reading this!! Well done, Juliet M. Sampson on novel II!!! I look forward to reading your third installment!! 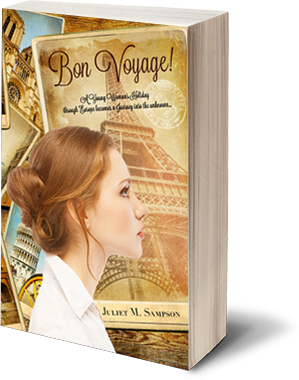 I have just read Bon Voyage by Juliet Sampson and I must say it has driven my eagerness to travel to Europe. In fact whilst reading the book, I felt that I too was travelling alongside Juliet. This book was written in a way that is understandable to audiences of all ages. Juliet has done an exceptional job in describing the countries and places she has visited in Europe, such as Rome, Venice, Brussels and of course Paris.